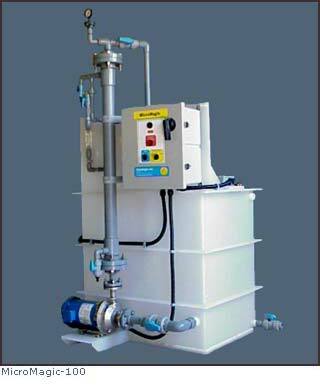 The system consists of a floor mounted module with a holding tank for concentrating contaminants. All components are corrosion resistant: polypropylene, CPVC and stainless steel. Once the contaminants in the tank reach saturation, servicing is by pumping out or draining through the bottom threaded fitting. Available options permit customization to the application, and the system compliments Aqualogic’s ion-exchange and evaporation waste reduction systems for zero-discharge.